My name is Mike Hiestand. And I’ve been telling Mary Beth’s story for more than two decades. Today, Mary Beth and I launched a crowdsourcing campaign to fund a nationwide bus tour so we can share her story with students at schools, colleges and conventions across America. We’re calling it the Tinker Tour. And I’ll be honest, it feel big and important. 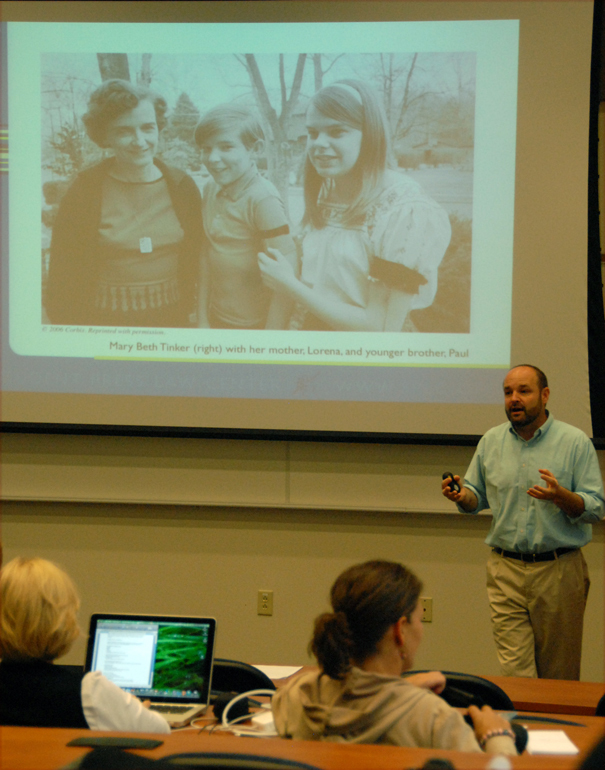 For over 20 years — as a lawyer with the nonprofit Student Press Law Center — I spoke to students and teachers all over the country about free speech issues. And each time I did, I would begin by telling Mary Beth’s story. (I joke with her that I may have told her story more than she has.) While her landmark Supreme Court case, still cited in every student speech rights case today, is a logical starting point for a legal discussion, her story is something much more. It is a powerful teaching tool. While the students would file into the room, eyes somewhat glazed over as they prepared to hear a lawyer talk, I would watch and feel the mood in the room change as I told Mary Beth’s real, simple — and powerful — story. In a time where very little seems simple, her story really is. Her story feels quintessentially American when it’s hard to pin down what that even means anymore. A shy, young girl in Iowa stands up for what she believes – and in doing so changes the world in which she lives. Because of what Mary Beth, her family and friends did, each of the tens of thousands of students to whom I spoke had a legal right in this country to have their voice heard — whether the college president or principal wanted to hear it or not — as long as they did so peacefully and with respect for the rights of their fellow students. Her story wakes students up. It really does. It woke students up when I told it. And my-oh-my does it wake students up when she tells it. In doing some “test runs” for the Tinker Tour, I accompanied her to a few schools and a state conference and I’ve seen the Tinker magic firsthand. She is a civics education rock star. 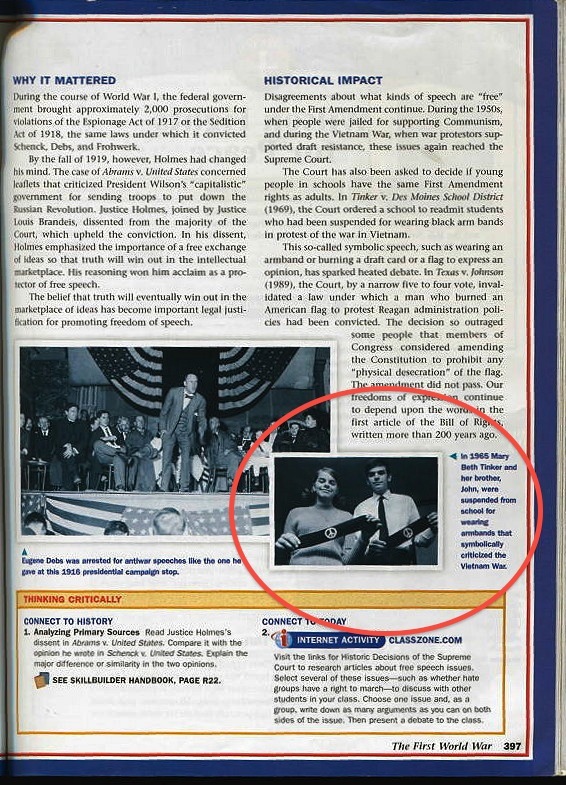 She is in my daughter’s high school history book. She’s listed, along with Thomas Paine, Harriet Tubman, Albert Einstein, Helen Keller, Muhammad Ali and 100 others in the 2012 book, 101 Changemakers: Rebels and Radicals Who Changed US History. (Students love that!) 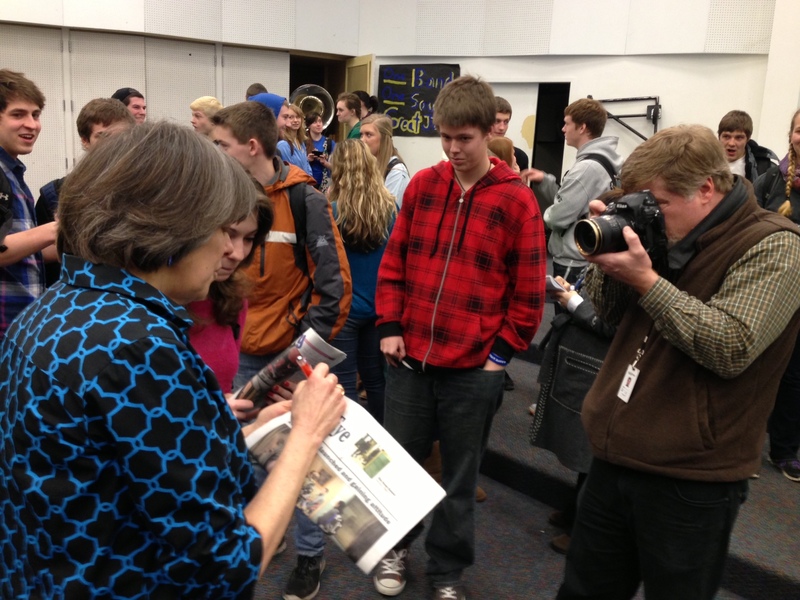 She is greeted with requests for photos and autographs by students, teachers – and even quietly sometimes by the journalists who show up to cover her visit (most of whom studied her case in their media law classes in college.) It’s beautiful to see. A visit with Mary Beth is a powerful and rare opportunity to experience history looking you (kindly and politely) in the eye. Seriously, this bus trip is like having the chance to go on tour with someone like Rosa Parks. As a First Amendment and civil rights lawyer/educator, I’m in heaven! And that’s why when Mary Beth sent me a kind congratulatory email last year for an award I won as I retired from full-time work with the SPLC (which is something she does — truly, she carries around a notepad and jots down everyone’s name and story whom she meets), the idea for the Tinker Tour hit me. And though I was working hard with my brother to get our startup company off the ground, the idea wouldn’t let go. Because if we truly care about civics education and the role of free speech in America, this is not an opportunity to be passed up. In fact, the idea for the tour probably needed to come from me. Mary Beth sincerely believes that the story is not about her. Of course, she was there, but she reminds everyone that she was just a shy, 13-year-old girl who did what she did because she was sad about the war, watching it on TV night after night as she fixed dinner with her sister, Hope. One of my favorite lines from Mary Beth’s story is when, after being called down to the main office on the day she wore her armband in December 1965, the school secretary told her she needed to take it off. She did so with some relief, she says. But that was not that. Which is why today we all have the wonderful opportunity to support the Tinker Tour, where Mary Beth can stand before our next generation and pass on her story. Admittedly, the idea of the Tinker Tour sometimes feels a little bit like a Disney movie. But I loved Disney movies. They were magical. They sparked imagination. They provided hope. And in that lay their power. Yes, our next generation faces serious challenges. But, unlike at any other time in recorded human history, this generation is connected in a way that makes serious change not only possible, but inevitable. And that’s not a fairy tale. It’s real life. We are seeing it play out — in real life — around the world as young people (and young at heart) work together to demand change — to demand better — of their government, their media, their educators, their financial and social systems. Sometimes the change is big and global. Sometimes the change is small and personal. It all counts. Change begins by believing change is possible. And that belief begins one person at a time, from looking within. And feeling the hope. Nearly five decades ago, Mary Beth worked changed the world with a simple, black armband. Can you imagine what a 13-year-old – with all of the truly magical speech tools available — could do today? Please. Help us remind her. ← Tinker Tour to launch fundraising campaign tomorrow; STUDENT HELP REALLY, REALLY WANTED! I love that line, too!!! Thanks Mary.